Back to the Burgh and all of a sudden Christmas and the festive season is over, I find myself wanting to eat some proper comfort food. Having a chat with Fred from L’Escargot he was talking to me about the essence of what’s important in food. The main thing being taste……simplicity and making the best of a great ingredient. When you’re at the farmers market this makes even more sense. So with all of this in mind I got a great selection of produce from the market and went off home to create something. 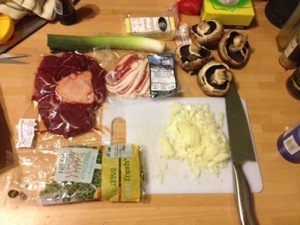 Starting with shin of beef, beef stock, onions, mushrooms, maris pipers, smoked butter, thyme and streaky bacon. Using a base of diced carrots and celery I was good to go. With the beef I took the meat from the bone and removed the marrow from the centre. Dredging the cubed meat in the flower I seared it in the pan. Adding some oil to the same pan I sautéed the onions, bacon, cubed bone marrow, celery, carrots and some garlic in the pan. Once soft I added mushrooms and after a minute put in 2 large glass of wine. 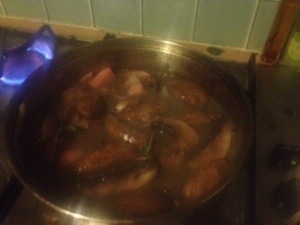 Using the wine to deglaze the pan I then put back the beef, added a pint of stock as seasoned with salt, pepper and thyme. Then left on a low heat for 90 minutes it makes for a relaxing Sunday. 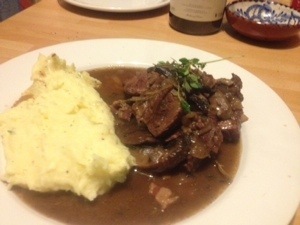 To go along wither beef I made a nice buttery mash, for something a little different I added some smoked butter. The smokeyness worked really well with the beef and make for a satisfying Sunday meal.